The tubes used to generate X-rays are a core component of X-ray tomography machines. They operate on the basic principle of electron beam tubes. Free electrons are generated in a vacuum by thermionic emission, and accelerated by an electrical field generated by voltage between two metal electrodes, so that an electron beam is formed. In an X-ray tube, this electron beam impinges on the metal surface of the target. If the acceleration voltage is high enough so that the kinetic energy of the electrons is sufficient, then X-rays, a form of high-frequency electromagnetic radiation, are produced. The frequency range of the X-rays generated depends on the voltage between the cathode and the anode of the tube (the cathode voltage) and on the target material. The radiation from an X-ray tube can be considered as a flow of photons of various frequencies. Because the energy of a photon is proportional to its frequency, the selected electrical voltage of the X-ray tube affects the frequency and thus the energy of the photons. This is important when selecting the X-ray tube, because certain materials can be measured optimally only with a relatively low level of radiation energy. Other materials, however, can be penetrated only by high energy radiation, and therefore require a higher cathode voltage. In practice, the maximum voltage depends on the type of tube and is between 90 kV and 450 kV. To measure typical plastic parts, a voltage between 90 kV and 130kV is sufficient. If parts that contain metal are to be measured, a higher voltage is required. Linear accelerators can generate X-rays with higher energy than those produced by X-ray tubes. They are currently used only rarely due to their high cost. High-energy radiation produced by accelerators can be used for penetration and tomography of very large metal objects, such as complete engine blocks. 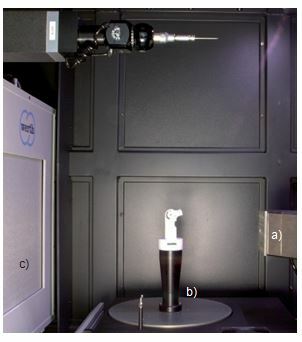 Seen in image above, the core components of tomography: a) 225 kV microfocus X-ray tube, b) High precision, air bearing rotary axis, c) X-ray sensor with about 2000 × 2000 pixels.